Session 357. A northerly was blowing most of the day. I called by The Zu Boardsports to pick up their Airush Union 10m demo kite, then checked at Brighton at about 2 p.m. Three kites and five windsurfers were out. Stu S and I then headed down to Frankston for some cleaner less fickle wind. I unpacked the Union and was immediately stumped by the huge oversize single valve. It seemed I was missing a fitting for the air hose from the pump until I realised the large fitting on the hose pushes into the valve for a snug fit. There is now only one valve instead of the two older inflate and deflate valves. The kite inflates very quickly and deflates extremely quickly. The single oversize valve is definitely an improvement. "to unite the key freestyle characteristics of the razor, with the key characteristics of our industry leading wave kite and the freeride abilities of the lithium." I think they have achieved this very well. Wind speed for this session ranged from 15 to about 23 knots. The inflate/deflate valve is huge and very effective to use. I swapped kites with Stu so he could try it out. It has been a while since I used a Switchblade 10m (2009 model) and was surprised by its power and the sluggish turns. I crashed and tangled it on a turn and floated in. Stu like the Union a lot. So did I. Session 356. A strong easterly came in mid afternoon, we headed to Mentone. With my Lithium 9 out of action it was a toss up between my Lithium 12 or Crossbow 7. The wind was lighter on the beach so I took out the 12 and was overpowered most of the time. It was very easy to get big air and good speed. The wind swung around to full east so there was a lull close to shore. Heaps of wind further out. I was rigged on the bottom knots and fully de-powered but still on the limit at times. I was missing my 9m kite which needs a repair and new bladder. Some windsurfers were having a great time. I raced them a couple of times but the swell was not conducive to full speed for me. Tarren, and the two Stus had a good time too. Session 355. Foil session 1. I got down the Hampton at around 4:30 and helped Tony with a refresher on kite rigging and flying - he went well. I was very keen to have ago on my foil board (Cabrinha Double Agent) so today was the day. There was about 18 knots at Hampton and some swell so conditions were not ideal for learning but I decided to give it ago. Carrying the foil sideways was not too difficult. However, once in the water its a beast. The foil protudes a long way under the board and has a mind of its own. I walked out as far as I could and attempted to body drag out further, to no avail. I tried keeping the board sideways with my foot in the front straps and dragging out, that didn't work well either. The foil acts as a massive lever under the board. When it catches it spins the board around. It was like being a rank beginner again, unable to get off the beach! Those that say learning to use a foil board is hard are correct. Further along the beach the board was a real handful in the breaking waves. I dropped the kite a couple of times while wrestling/juggling the board. The second time I decided to come in. There was a bang then a limp kite. I think it was folded by a wave and the leading edge tore then the bladder burst. Not good. I packed up with my tail between my legs and pondered the next foil board session with Eric and Anthony. 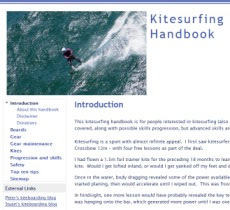 Its hard to learn but another kiter was out on a foil board and going well. As he said, you don't believe its possible until you see someone doing it. Kitesurfing tour from Balnarring to Flinders - won the double! Session 353. Stu Styles scoped out a good South Easterly for a kitesurfing tour from Balnarring to Flinders. After yesterday's nice session at Hampton today we won the double. Great wind and great kitesurfing. There were quite a few kites out at Balnarring. We did a few runs then got going to Point Leo and scored some good surf on the prominent reef. A word of warning though - some of the reefs suddenly appear in the water and can present serious obstacles. I headed upwind toward Flinders. The others were all closer in to shore near Point Leo, it looked like they would stay put there so I kept going, intent on getting to Flinders. It took a couple of tacks to get there. There were a lot of people on the pier and several boats moored there. As I approached a small sandy beach just north of the pier the wind softened, so I decided to head back rather than go to shore and get stranded. It was a nice fast downwind run to the others who had just started heading to Flinders. I kited past and waved, conversation across the water being difficult. I kited back to Suicides at Point Leo and rode some waves, then continued north surfing the reef before heading back on a tack. It was a long tack back. I used the rear footstrap for a rest and straightened my rear leg. I kept going until I got close to Somers Yacht Club then did some fast downwind slalom turns to get back to Balnarring. I logged 49 km for this trip. I rested on the beach for about 10 minutes watching for the others coming back. I couldn't see anyone so I decided to head back to spot them. The wind was stronger as I tacked across. I saw a kite but it was Chronos foil with a kiter on a foil board and they were flying. Then I came up to Stu S and Anthony who were on there way back. I continued on the Point Leo and saw Stu W and Mike. No sign of Eric. Tarren had returned earlier. Eric had lost his board and body dragged in to Point Leo so we drove there and picked him up. We had fish and chips at Balnarring then headed home. I took my Spot tracking device on this tour. The OK messages worked but only one track location was recorded off Point Leo. Maybe I have to have it on my shoulder so it can get better reception. Session 352. A good sea breeze! What a great way to start the New Year. The kite beach at Hampton was busy - quite a few beach goers and kiters. I did some nice runs out and back enjoying the swell, then headed down to Green Point for some more waves. The wind picked up a bit on the way back, it only took me 3 tacks to return. A few more tacks among the other kiters and a couple of back roll kiteloops, then I came in.